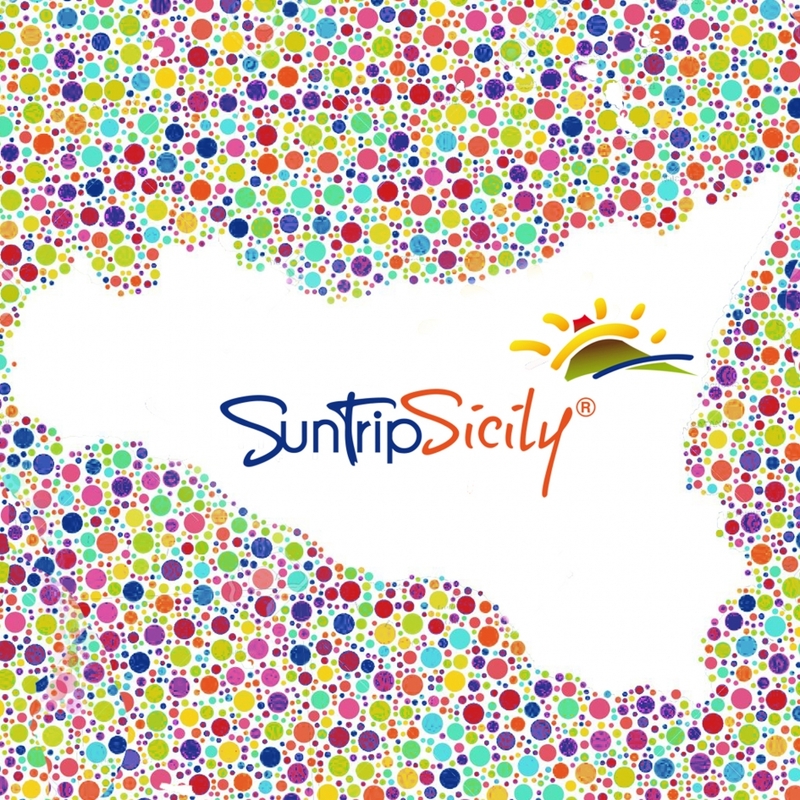 We of "SunTripSicily" share our love and our knowledge about Sicily with you and we recommend the best way to discover and experience our Island. 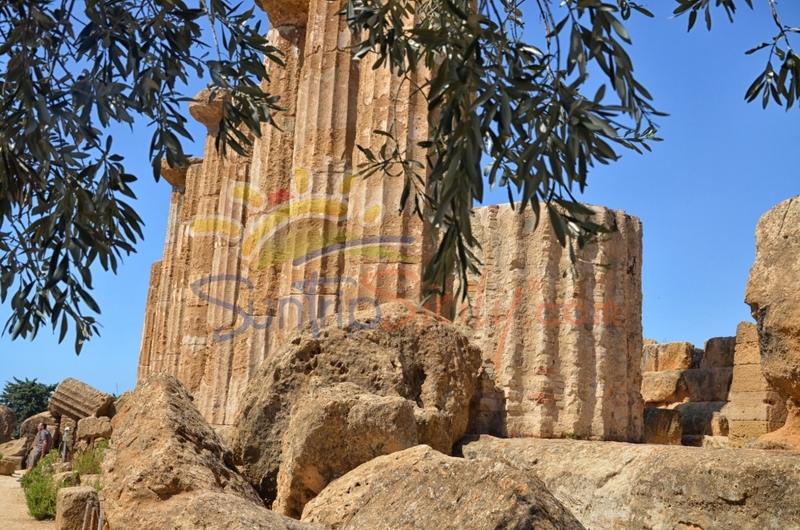 Sicily is home of the most significant UNESCO World Heritage sites in Italy. 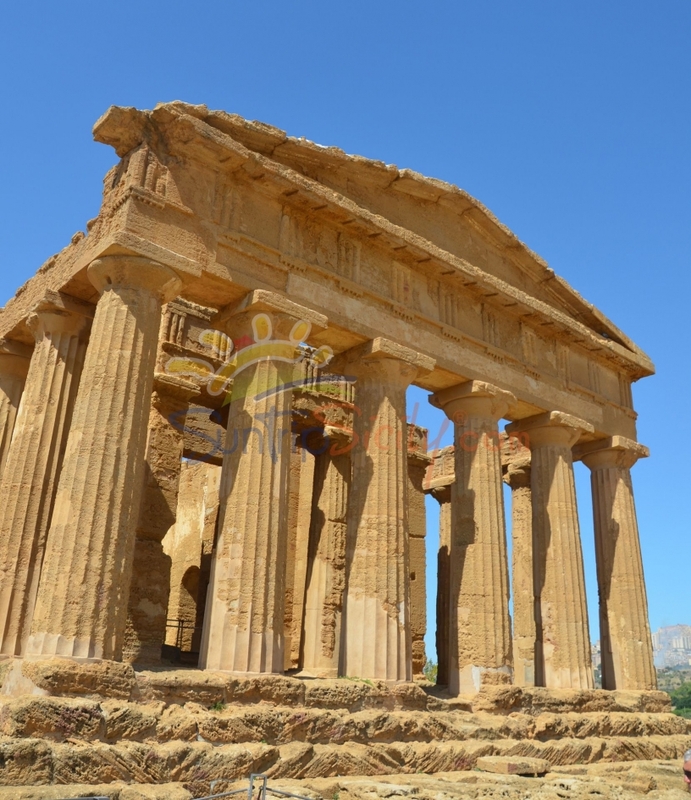 From Greek temples and theatres to Roman villas from Byzantine mosaics to Norman cathedrals from Sweden castles to the baroque cities, Sicily is full to the brim of world famous historic, architectural and art masterpieces. 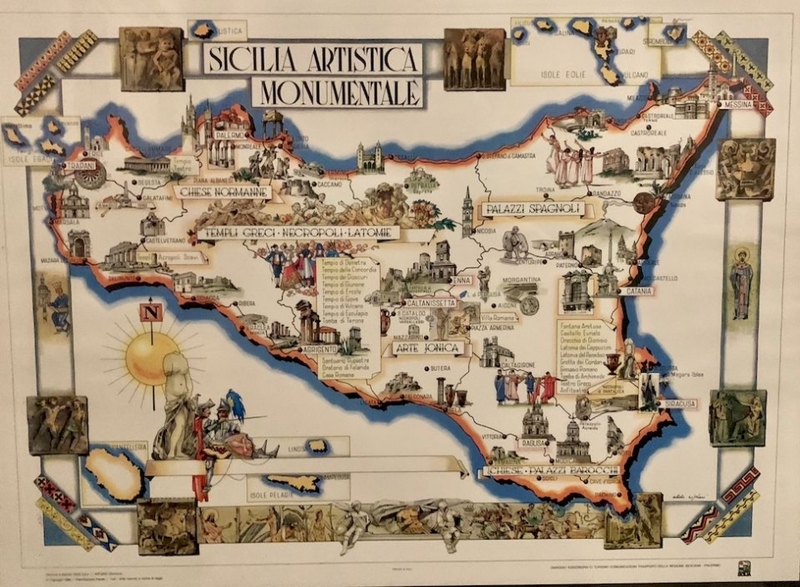 Sicily is the biggest island in the Mediterranean Sea, it has the shape of a triangle and the three sides of this triangle are opposite to three different continents: Africa, Europe and Asia. 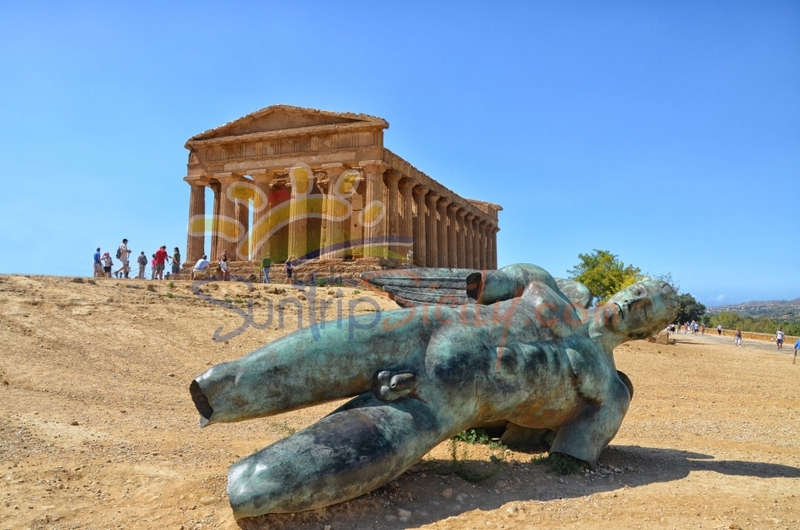 The island has been inhabited since the Palaeolithic times and with its pot of cultures, Sicily is Italy’s most historically cosmopolitan region with influences from Sicans, Sikels, Greeks, Romans, Barbarians, Byzantines, Arabs, Normans, Swebians, Anjevins, Aragoneses, Spaniards, Savoys, Austrians, Bourbons. 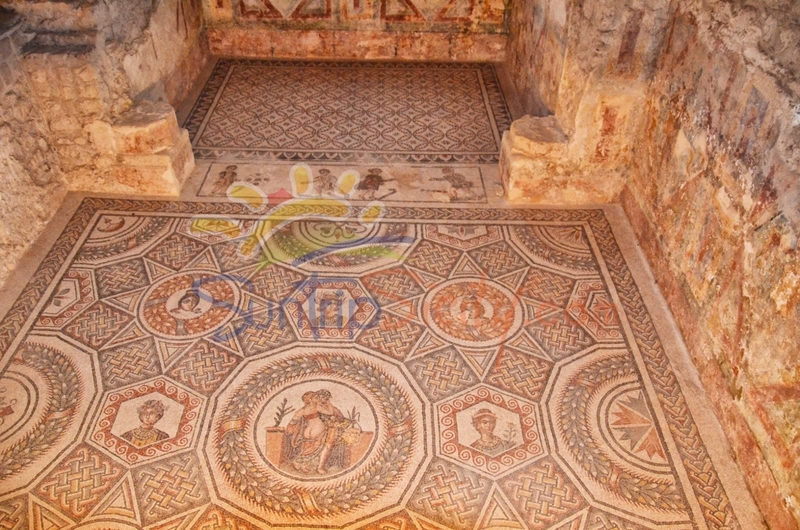 This pot of cultures has created a unique historic legacy and treasures of art, archaeology, architecture and traditions of inestimable value. 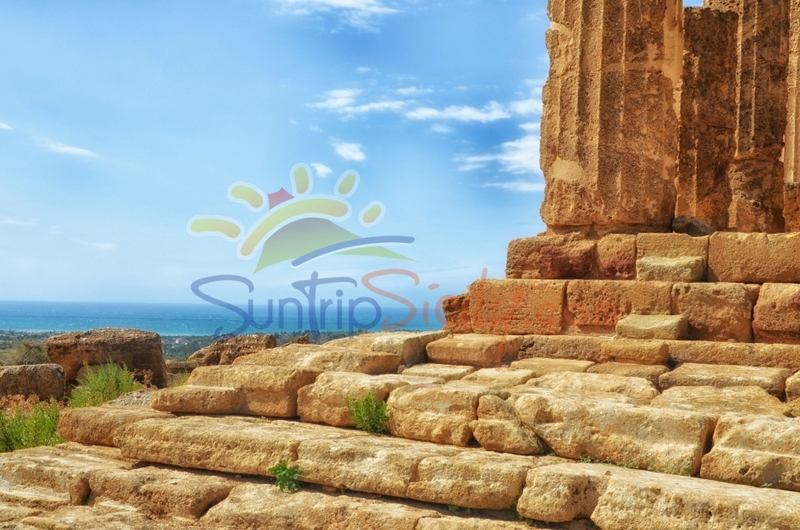 "SunTripSicily" has made a selection of places that you can’t miss out during a holiday in Sicily in one of our stunning villas because their positions are perfect for any kind of movement around the East Coast of Sicily and the most beautiful sites worth visiting in our Island. 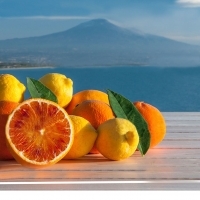 Our villas are between Taormina and Mount Etna, the baroque of Catania and Acireale and about an hour and an half drive from the beautiful towns of Siracusa, Noto, Enna and Piazza Armerina. Destroyed time and time again by volcanic eruptions, war, earthquakes and other disasters, Catania always managed to get back on its feet! The city rose from the rubble, complete with wide streets, piazzas and monuments. 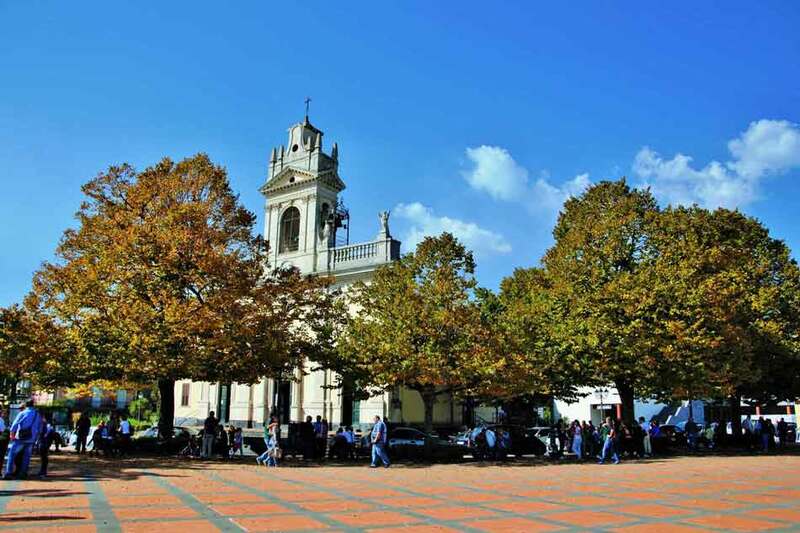 The town is centred around Piazza Duomo, which is lined with an elegant baroque ensemble. In the middle of the square stands the “Fontana dell’Elefante”, in dialect called “u Liutru” and it is the symbol of Catania. On the south side of the square sites delicate “Fontana dell’Amenano”, named after the underground river that supplies it on its way to the sea before disappearing again. Behind it there is the Piazza Alonzo di Benedetto, where a picturesque and bustling fish market takes place daily. The star of the square is the Cathedral dedicated to St Agatha, the saint patron of the city; it was erected in the late 11C by the Norman king Roger I and rebuilt after the earthquake of 1963. Via Etnea is lined with elegant palaces smart shops and boutiques. 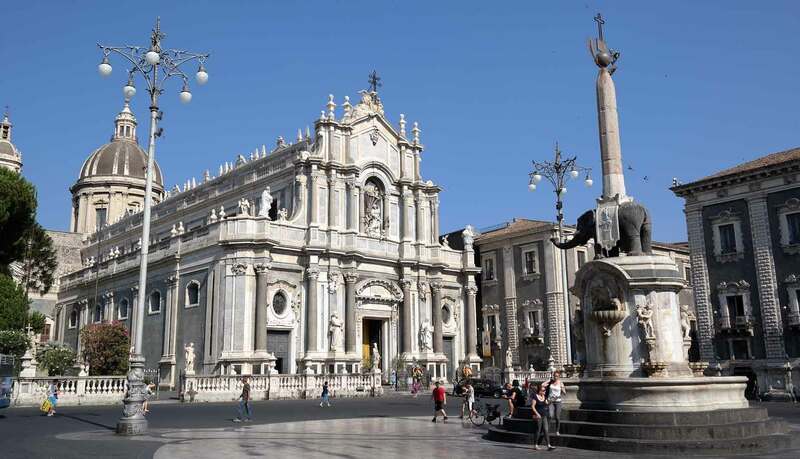 It runs for two kilometers from Piazza del Duomo through Piazza dell’Università and Piazza Stesicoro where you can still see the ruins of an enormous Roman amphitheatre; halfway up there is Villa Bellini, Catania’s flowers-filled public gardens and the botanical garden. The Museo Belliniano is dedicated to Catania’s most famous son: the composer Vincenzo Bellini. A short walk will take you to another building dedicated to his memory, the opera house Teatro Massimo Bellini. "SunTripSicily" tips: reach Catania by train and catch the metro, just in front of the station, to arrive in the city centre. Don’t miss the Benedectine Monastery, with its opulent decorations, and Via Crociferi, Catania’s baroque street par excellence. The old town of Akis was founded by the Greeks, and it is certain that during Roman times the town took part in the second Punic war. Earthquakes and lava flows destroyed the old town, which was rebuilt on the plateau where it stands now. The city features splendid Baroque architecture, to be seen especially in the Town Hall, in the Cathedral (decorated inside with fine frescoes, and hosting also an 1843 sundial) and in the Churches of St Peter and St Paul and of St Sebastian. The aristocratic palaces are graced with elegant wrought-iron balcony. 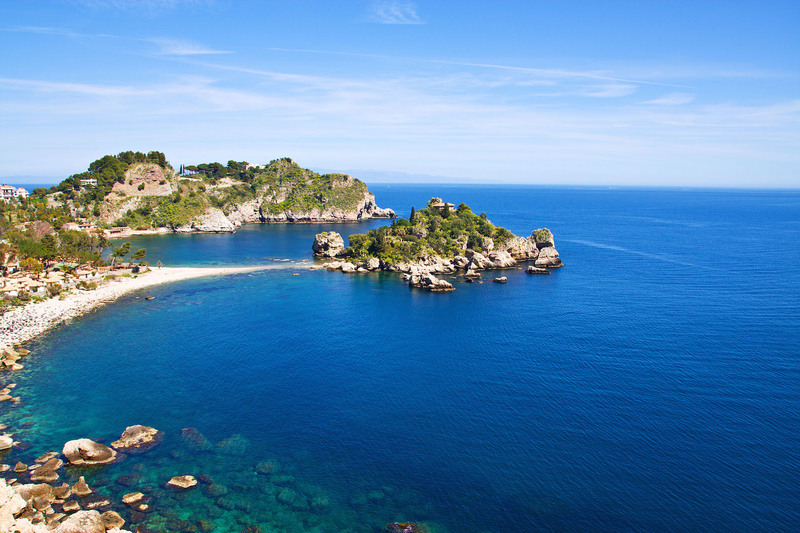 Around Acireale you will find some lovely fishing towns, like Acitrezza, known for the rocks of the Cyclopes (Faraglioni dei Ciclopi), jagged black lava rising from crystal-clear water. The Odyssey relates that these rocks were hurled by Polyphemus against Ulysses. Next to the rocks sits the island Lachea, now a biology research station; Aci Castello is a seaside village on a stretch of coastline dotted with lemon trees. In the main square you can visit the Castle, a Norman fortress built with blocks of black lava, which today houses a small museum with a collection of archaeological artefacts. 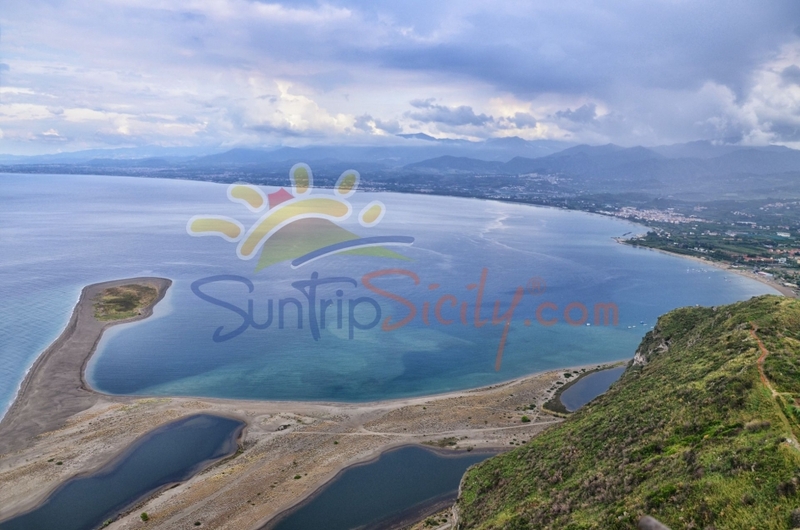 "SunTripSicily" tips: enjoy the lovely view on Mount Etna and on the Ionic coast from the public garden “Villa Belvedere” and hike in the “Riviera of Lemons” reaching the “Timpa”, a cliff sloping down to the sea, green with luxuriant Mediterranean vegetation. 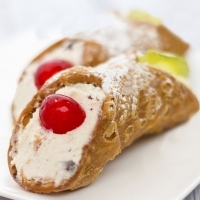 In February you can live up the main attraction in Acireale that is the "Carnevale"! 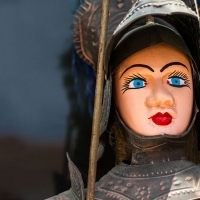 It is one of Sicily's most spectacular popular events and one of the largest and busiest carnivals in Italy. With its dizzying enormous allegorical floats created by the local craftsmen, dancing schools, concerts and confetti parades not to mention lashings of food and wine, the “Carnevale di Acireale” offers fun for all the family and a fascinating insight into the way the Sicilians have a good time! The little town was founded in 1520 and it is known for its many beautiful churches, generally in Renaissance style. The Royal Capizzi College is one of the most interesting building. You can’t miss to visit the “Masseria Lombardo”, an old Sicilian farmhouse with an ethnographical museum of the people of Etna. "SunTripSicily" tips: taste the pistaschios that are widely considered to be amongst the best in the world and protected by a DOP label. Every year, between September and October, you can enjoy the Pistachio festival fully devoted to this tasty fruit and its unlimited food applications. The festival is also enlivened by several side events, such as exhibitions, concerts, handcraft markets. This town has two castles: the first stands on a hilltop near the church of the Holy Crocifix which goes back to 1484. The second is near the sea, on the beach of San Marco from whence it gets its name. "SunTripSicily" tip: live up the exciting Saint Philip feast held every year in May. The statue of the saint is carried down a steep hill by the worshippers in a very fast run from the Church of the Holy Crucifix to the Cathedral, in Sicilian dialect is called "A calata". Caltagirone is the town of ceramic and pottery. The plan of the city is medieval, but in the eighteenth century Caltagirone was enriched with Baroque buildings, each having a local touch, such as the addition of decorative elements in coloured ceramics. In Caltagirone there are many monuments worth a visit, such as the Cathedral, the Regional Museum of Ceramics, the Church of Saint James and the Church of Saint Mary of the Mount which stands on top of a 142-step stairway, locally called “La Scalazza”. The stairway was built to unite the old part of the town to the new one in 1844 and was decorated with coloured ceramic tiles in 1954. "SunTripSicily" tips: visit Caltagirone during Christmas time to see the handmade cribs or in May for the Madonna of Conadomini, or in July for the feast of the patron Saint James when the starway forms a lightened design: an unusual tapestry of fire, formed by five thousand lamps burning olive oil and covered by coloured paper cylinders called “coppi”. You can treat yourself with a special souvenir made by the local ceramist. In 730 BC the Greeks built a fortress on the mass of sandstone where later the Castel Leone - Lion Castle - was built, which gave the city its name. Castiglione was for strategic reasons, one of the most important towns of the Alcantara Valley. "SunTripSicily" tips: visit the castle and the Alcantara river. Taste the solicchiata wine in one of the winery along the wine street. The town takes its name after a river that flows underground and spring here with cool water flowing through thick clumps of papyrus, very interesting to see. "SunTripSicilily" tips: take an exclusive photo in “La piazza del bacio sublime” a square along the street “Via G. Di Vittorio”. There is an art installation to celebrate the Sicilian love for Mount Etna: put your camera on the statue of the girl and go behind the heart in the panel. 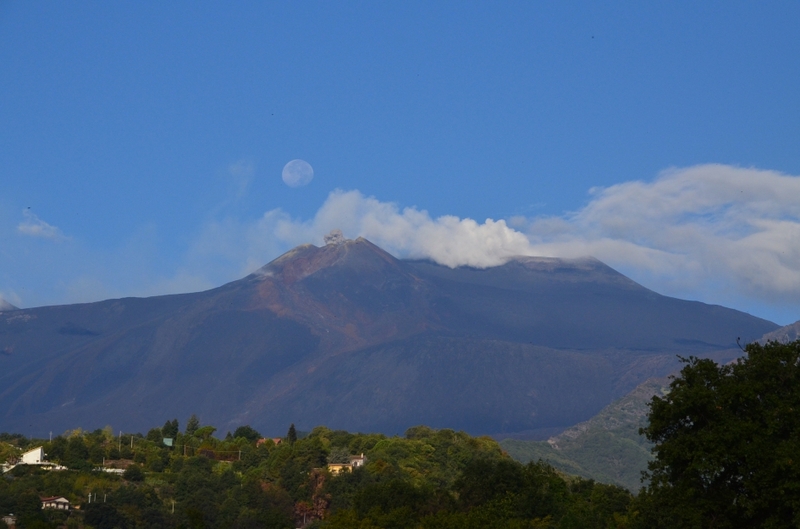 You’ll take a picture with you and your loved ones with the background of the Etna framed by an hearth. It owes its name to the terracotta jars (called in dialect giarre) which are still made there today by local craftsmen, together with wrought iron and copper objects and the characteristic Sicilian puppets. Giarre is also the “town of flowers” due to many garden centres. 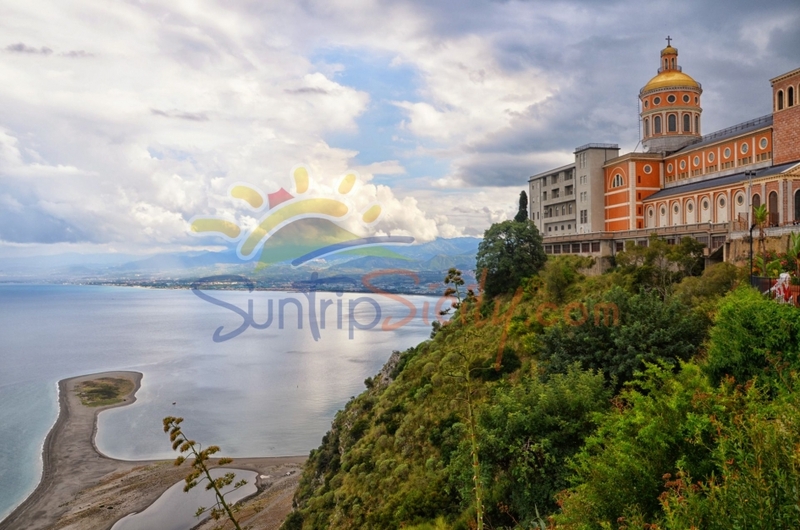 "SunTripSicily" tips: visit the Cathedral designed in Neoclassic style with two bell towers. Enjoy the shopping in the main streets of Via Callipoli and Corso Italia. 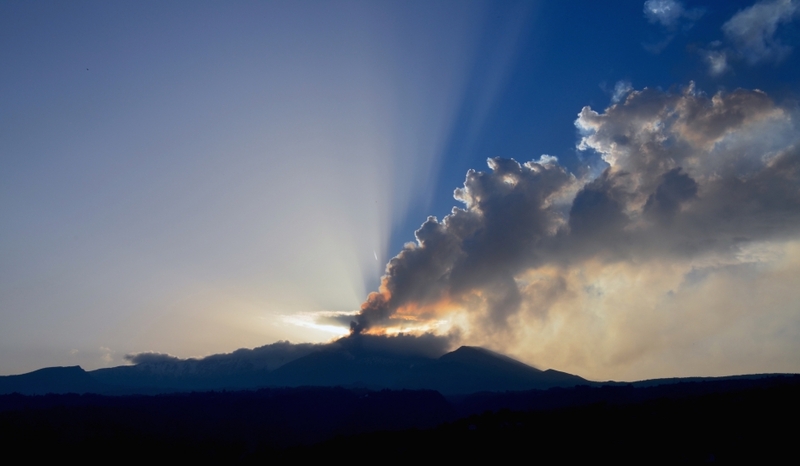 The name of the town probably derives from a large tongue of lava erupted from Etna. Such an attractive little Sicilian mountain village, neat and tidy, full of flowers, surrounded by the Ragalna pinewoods offers good sports facilities too. Ski lifts and also cross-country skiing are available at Piano Provenzana. 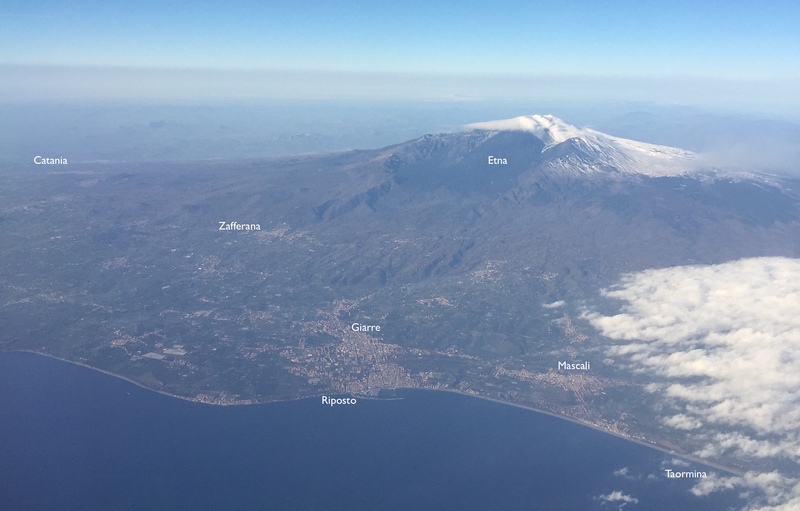 "SunTripSicily" tips: ski on the top of the highest active volcano in Europe: Mount Etna in winter is covered with snow and there are different ski areas and ski runs in Linguaglossa. In summer evenings go to Linguaglossa and enjoy the fresh air after a hot day touring around. It is the only town to have been completely destroyed by the lava of Etna in modern times. Today Mascali, completely rebuilt after 1929, has a very modern appearance. It represents a monument to the determination of the people of Etna, who are never discouraged by the setbacks caused by the volcano and are always ready to rebuild whatever Etna destroys. "SunTripSicily" tips: Cycle along the sea cycle line in Fondachello beach in Mascali to enjoy the pebble beaches. It is a small village on the slopes of Mount Etna. Can be clearly seen the lava of 1852 and also the 1950 flow, both of them stopped at about 300 metres from the village itself. "SunTripSicily" tips: visit Milo during the hot summer days in the evening to enjoy the stunning view from the square and the fresh air of the night. The best time to see it is in September when the special manifestation dedicated to the wine production and called “ViniMilo” takes place. The town hosts the offices of the “Etna National Park”. Here there is also a small vulcanological museum. Nicolosi is above all an excellent departure point for excursions up to Mount Etna: from here it is easy to reach the facilities for those who wish to arrive at the top of the volcano from the southern side. "SunTripSicily" tips: Go to the top of the highest active volcano in Europe. Have a wine tasting in an Etna winery to discover the Etna wine production. For its outstanding position, Piedimonte was once called “Belvedere” and in fact the views from the village are really extraordinary. "SunTripSicily" tips: visit Piedimonte during the main events of the year: the harvest grapes festival and the chocolate festival: the first takes place in September and the second one in February. It was once known as the “Queen of Alcantara” for the lovely palaces and churches. The three main churches are like treasure-chests containing precious jewels. 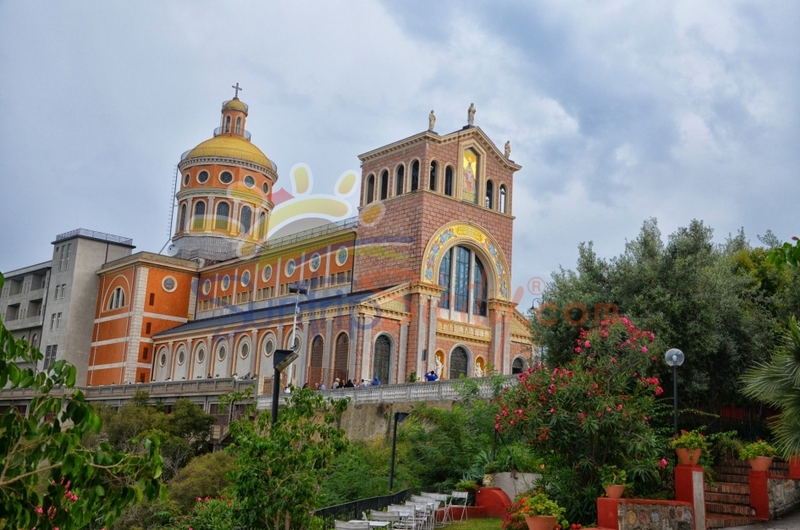 "SunTripSicily" tip: go there on the 15th of August to seeing the special feast of St. Mary Assunta. Here a well-equipped port opens onto a splendid bay. The beaches are lovely and attract many bathers. Admirable is the harmonious architecture of the St. Peter's Cathedral. The beautiful palace which now houses the Town Hall is certainly worth attention. "SunTripSicily" tips: go to the famous fish open market: an explosive blend of scents, colours, flavours where the fish, usually fished the previous night is sold. Take a walk along the sea and taste an ice-cream or eat in one of the fish restaurant over there. It is surrounded by generous vineyards, hazel trees and chestnut woods. 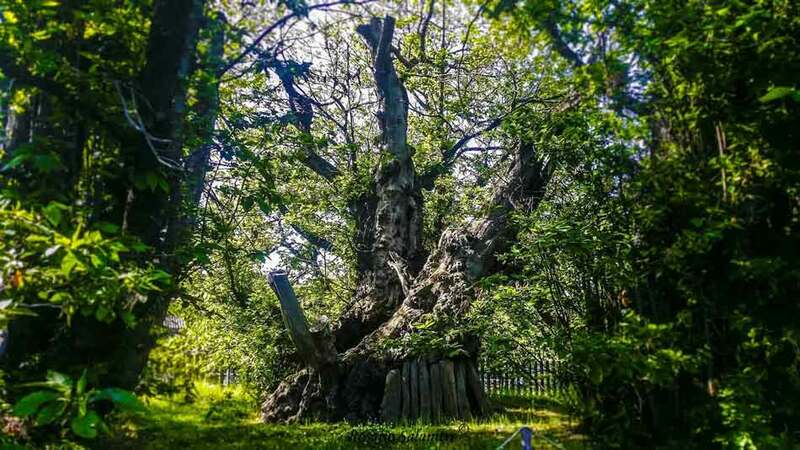 Within the territory of the village there is the famous “Chestnut Tree of the Hundred Horses”, a splendid tree of really amazing proportions: the legend says that during a storm, Queen Joan of Anjou took shelter under its branches with her following of one hundred knights and their horses. 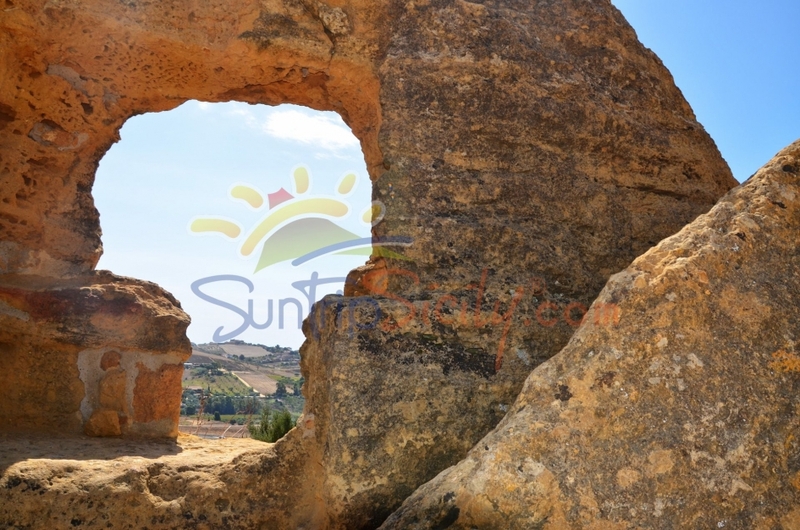 "SunTripSicily" tips: enjoy a splendid view from the main square and from the “Calvario” Church. Taste the typical “Paste di nocciola” Hazelnuts cookies. The name of the town recalls the vivid yellow colour of the sweetly-scented gorse and of saffron, both abundantly present in the woods around the town. The public gardens in Zafferana are lovely full of magnolias and camellias, and offer a magnificent view over the Ionian coast. The cathedral has a Baroque façade. 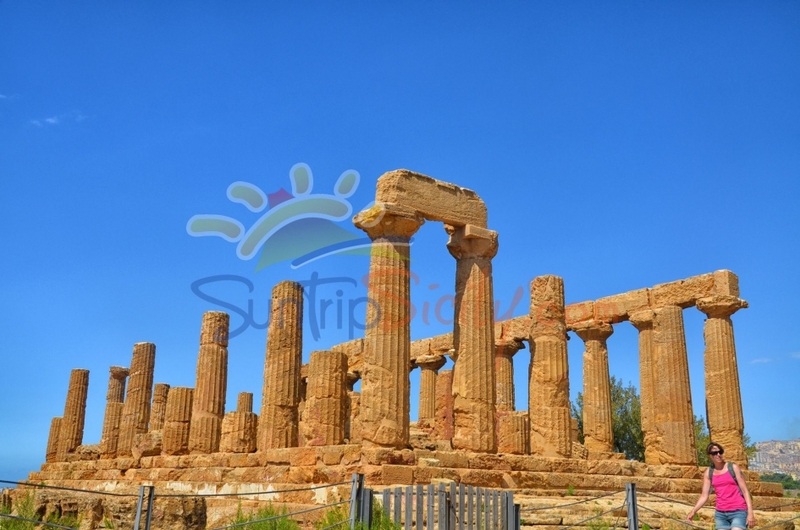 "SunTripSicily" tips: taste the Sicilian pizzas and the big chocolate biscuits called “Sciatori”. Every Sunday of October a festival along the streets and the squares takes place to celebrate the local Autumn products. DISTRICT OF "SIRACUSA - RAGUSA - NOTO"
On the Island of Ortygia, connected by three bridges to the mainland, you find yourself in the thick of the monuments. The piazzas, streets and sidestreets trace a border around this small jewel box and its rocky beach, and its buildings, churches, temples, walls and facades decorate each corner. Piazza Duomo is an attractive irregular square where stands the magnificent Cathedral, built on the site of an ancient Temple of Athena as can clearly be seen from the original Doric columns that were incorporated into the building’s main structure. The 1693 earthquake caused the front façade to collapse; it was rebuilt in the Baroque style by the Palermo architect Andrea Palma. 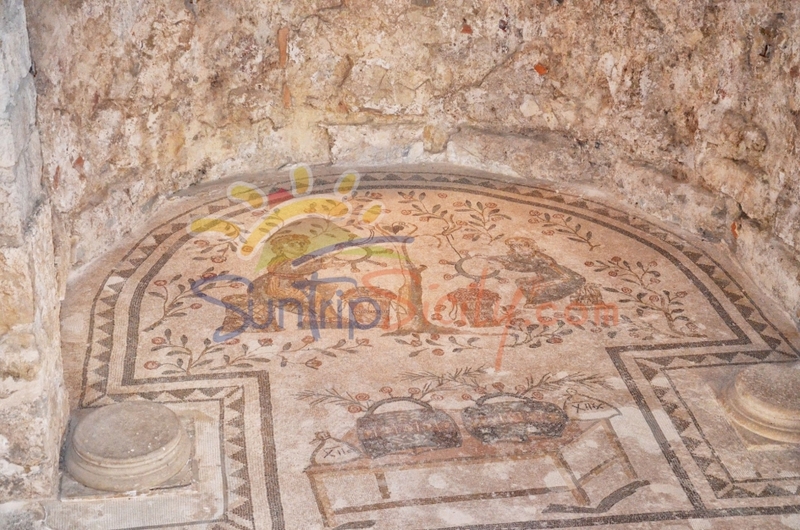 "SunTripSicily" tips: visit "Ortigia's Museo del Papiro": papyrus plant grows in abundance around the nearby Ciane river and was used to make paper in the 18th century. The museum offers a fine collection of papyrus documents and products. Visit the Greek theatre between May and June and enjoy a live performance of Greek plays. The history of southern Sicily has been shaped by a single natural cataclysmic event: the earthquake of 1963 which destroyed dozens of towns. Out of the rubble rose some of the most fanciful Baroque architecture the world has ever known: churches, palazzi and public squares were reborn in what Unesco called: “the culmination and final flowering of Baroque art in Europe”. 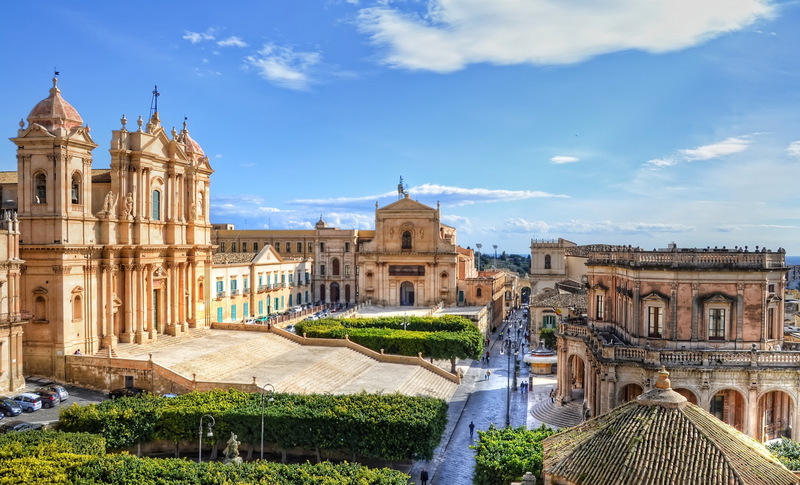 Noto is, quite simply, the apotheosis of Baroque town planning and architecture! Prior to 1693 Noto stood some 10km away from its present site. The earthquake destroyed the old town and a less vulnerable site was chosen for the new town. Many Sicilian artists cooperated in Noto’s reconstruction, conducted under the supervision of the Duke of Camastra, acting representative of the Spanish viceroy. The new town was built like a stage set: its perspective were enhanced with curvaceous forms and curvilinear accents in facades, decorated brackets and keystones, curlicues and volutes, masks, cherubs and balconies with wrought-iron railings. The main axis is Corso Vittorio Emanuele, which runs through three piazzas, each with its own church. Piazza Municipio is the buisiest and most majestic of the three squares, overlooked on the left by the eye-catching elevation of the Palazzo Ducezio and on the right by the flight of steps to the cathedral entrance, with its broad and decorated façade. Don’t miss a visit to Palazzo Nicolaci: the richly carved brackets are ornamented with fantastical cherubs, horses, mermaids and lions, grotesque figures including one, in the centre, with an exaggerated snub nose and big lips. 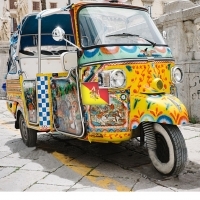 Come in May in Noto! 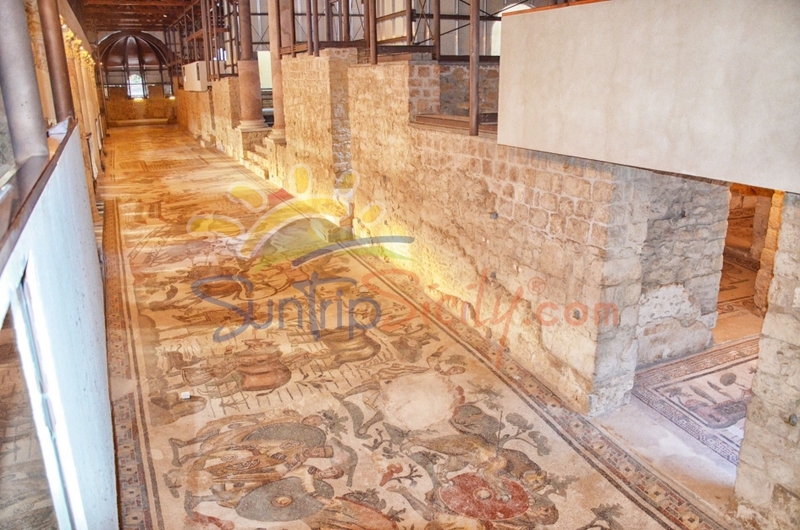 You will enjoy the spring festival which culminates in the famous Infiorata in via Nicolaci. Towards the middle of may the locals recreate brilliantly coloured tableaux of flowers composed entirely of petals inside the doorways of the palazzi. The cobblestones of the street are transformed into a giant canvas of petals to form designs which vary from year to year. Not far from this area there are amazing coasts and nature reserve. Descend into the Cava Grande Gorge and take a refreshing swim in the natural rock pools at the bottom! From above, there is a magnificent view over the Cava plunging between sheer limestone cliffs. The river winds along the valley bottom, opening out intermittently to make a succession of tiny lakes. On the other hand, you can also visit the Riserva Naturale di Vendicari, created in 1984. It consists of a strip of marshy coastline which provides a rare and protected habitat for migratory species and a variety of sand-loving Mediterranean vegetation.